Here is a collection of American Patriotic Themes. For all its problems we still get a lump in our throat when the flag passes by, when the National Anthem is sung, when we dig into the meaning of the Pledge of Alegiance. And our Scouts need to learn this. If you have something on a Patriotic Theme, send it my way and I'll include it here. "I am an American." That's the way that most of us put it, just matter-of-factly. They are plain words, those four; you could write them on your thumbnail, or you could sweep them clear across the bright autumn sky. But remember, too, that they are a way of life. So, whenever you speak them, speak them proudly, speak them gratefully -- "I AM AN AMERICAN!" They signed, and they pledged their lives, their fortunes, and their sacredhonor. What sort of men were they? Twenty-four were lawyers and jurists. Eleven were merchants, nine were farmers and large plantation owners; men of means, well educated. But they signed the Declaration of Independence full knowing that the penalty would be death were they captured. John Hart was driven from his wife's bedside as she was dying. Their thirteen children fled for their lives. His fields and his gristmill were laid to waste. For more than a year he lived in forests and caves, returning home to find his wife dead and his children vanished. A few weeks later he died from exhaustion and a broken heart. Norris and Livingston suffered similar fates. These are the stories and sacrifices of the American Revolution. These werenot wild eyed, rabble-rousing ruffians. They were soft-spoken men: men of means and education. They had security, yet they valued liberty more. Unwavering, they pledged: "For the support of this declaration, with firm reliance on the protection of the divine providence, we mutually pledge to each other, our lives, our fortunes, and our sacred honor." They gave us, you and me, a free and independent America. History books never told us much of what took place in the Revolutionary War. We didn't just fight the British. We were British subjects at that time, and we fought our own government. Many of us often take these liberties for granted. Should we? While enjoying our 4th of July holiday, pause and silently thank these patriots. It isn't that much to ask for the price they paid. FOR THOSE WHO ARE INTERESTED, here is the complete, un-edited text, as presented by Red Skelton, on The Red Skelton Hour, January 14, 1969. I have tried to recreate this as best as possible. With a hearing impairment, I may have missed a couple of words (hidden in the laughter during his introduction of the pledge), but this should be very close to the exact words that Red Skelton recited for his show. It is hard to recreate Red's timing and presentation. I still think he was one of the very best and wish he would release his show for re-runs. (I was a boy scout when I saw him do this on his show.) The presentation has background music and is hard to present better than Red Skelton did, especially if you have people there who had watched Red Skelton and they can imagine him standing there doing this. "Getting back to school, getting back to school, I remember a teacher that I had. Now I only wee, I went, I went through the seventh grade, I went through the seventh grade. I left home when I was 10 years old because I was hungry. (laughter) And .. this is true. I worked in the Summer and went to school in the Winter. But, I had this one teacher, he was the principal of the Harrison school, in Vincennes Indiana. To me, this was the greatest teacher, a real sage of..of my time, anyhow. "I've been listening to you boys and girls recite the Pledge of Allegiance .. all semester ... and it seems as though it is becoming monotonous to you. If I may, may I recite it and try to explain to you the meaning of each word. *I* -- me, an individual, a committee of one. *Pledge*--dedicate all of my worldly goods to give without self-pity. *Allegiance*--my love and my devotion. *To the Flag*--our standard, Old Glory, a symbol of freedom. Wherever she waves, there is respect, because your loyalty has given her a dignity that shouts freedom is everybody's job. *United*--that means that we have all come together. *States*--individual communities that have united into 48 great states. 48 individual communities with pride and dignity and purpose, all divided with imaginary boundaries, yet united to a common purpose, and that's love for country. *And to the Republic*--Republic, a state in which sovereign power is invested in representatives chosen by the people to govern. And government is the people and it's from the people to the leaders, not from the leaders to the people. *One Nation* -- One nation, meaning, so blessed by God. *Indivisible* -- incapable of being divided. *With Liberty* -- which is freedom, the right of power to live one's own life without threats or fear or some sort of retaliation. *And Justice* -- the principle or qualities of dealing fairly with others. *For All*--For all... which means boys and girls, it's as much your country, as it is mine." Remember Me? Yeah, that's right, red & white stripes, fifty stars on a blue field in the upper left corner, I am your Flag, but I've also been know by "Old Glory", the "Stars and Stripes", and the "Star Spangled Banner". Whatever you call me, I am the flag of the United States of America. I remember years ago that people used to honor me, fly me with pride outside their homes and at work, and children in school would Pledge their Allegiance to me every day. They would carry me in parades and people would watch and salute me with pride as I passed by, proudly waving in the wind. When men and woman saw me coming, the men removed their hats and placed it over their hearts and the women placed their right hands over theirs. And their children were taught respect for the flag, and what to do as well. Now I'm lucky if they even recognize me, or even notice at all. Now, the young boys and girls make fun of those who carry me, and call them names. They haven't learned, or don't remember about the thousands of men and women who gave up their lives for me. People who knew the the meaning of Freedom, Liberty, Justice, and Peace. Why has this happened? I'm still your American Flag. I haven't really changed that much... just added a few stars over the years, been a whole lot more places, and though it all, stood strong by you. Why don't people respect me the same way they used to? A lot of blood has been shed since those parades of long ago. A lot more men and women have died defending me. When you honor me, you honor those men and women who gave up every- thing for your freedom. When I am flown, I see people not notice. When I am in a parade, I see people just stand there, with their hands in their pockets. I may get a small glance, but then you look away. Next time, please notice and respect me. Next time stand and be proud to be an American Citizen! I see the young children of today running around and not being taught how to act when I'm around. Don't the parents of today care? Don't they know how to act? I saw one man start to take off his hat and looked around and saw no one else doing it, so just put it back on. I saw some kids calling the Boy Scouts who were carrying me names and making fun of them. I saw many just sit there as I passed by, talking with one another like I didn't even exist. Is it now wrong to be patriotic? Have today's Americans forgotten what I stand for and where I've been? If you don't care, who will? If you don't teach our children what I stand for, and how to act around me, who will? If our children don't learn how to respect our flag, what it means to defend our country, and how important Freedom, Liberty, and Patriotic Duty is, what future does our mighty country have? So, when you see me, stand straight, think about what I stand for, think about all of the Americans that have died for our country, and place your right-hand over your heart or salute to honor me. I'll be saluting you back by waving strong and proud in the wind. And I'll know that you remembered me. I am the symbol of the living America, the badge of its greatness, the emblem of its destiny. I am faith. It is I who keep men mindful of their priceless heritage, life, liberty, and the right to pursue happiness. I am hope. I represent the land of promise wherein, already, man's loftiest dreams have approached closer to realization than ever before on this earth. I am life. Each strand and fiber of my being is a memorial, dedicated to the sacrifices of all those strong men and steadfast women who have lived and died in the nation's service, that it might live forever. I am tolerance. So long as I shall wave, all people under my protection may freely worship, think, write and speak, undaunted by the shadow of fear. I am justice, tempered with mercy. For I am friend to the oppressed and downtrodden of every land. I am a sign of the future. I wave over schools throughout the nation and in them the nation's future is molded. I am the flag of the United States... the last... the best hope for peace on earth. I have led your sons into battle from Valley Forge to the dense jungles of Vietnam [deserts of Iraq]. My white stripes signify the yearning tears shed by Americans who lost their sons and daughters. I am old glory; for more the 9 score years I have been the banner of hope and freedom for generation after generation of Americans. Born amid the first flames of America's fight for freedom, I am the symbol of a country that has grown from a little group of 13 colonies to a united nation of 50 sovereign states. Planted firmly on the high pinnacle of American Faith, my gently fluttering folds have proved an inspiration to untold millions. Men have followed me into battle with unwavering courage. They have looked upon me as a symbol of national unity. They have prayed that they and their fellow citizens might continue to enjoy the life, liberty and pursuit of happiness, which have been granted to every American as the heritage of free men. So long as men love liberty more than life itself, so long as they treasure the priceless privileges bought with the blood of our forefathers; so long as the principles of truth, justice and charity for all remain deeply rooted in human hearts, I shall continue to be the enduring banner of the United States of America. Now, this was written for and about folks in the military but, there is a message for Scouts and Scouters alike. This poem appeared in the Hartford Courant this morning, and it is well worth sharing it with all of you. 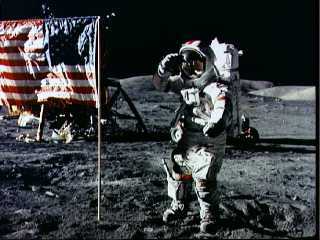 It was written back in 1971 inspired by sight of the American Flag on the moon. Don't have to tell my story. It's written all over me. I am your family tree. I would be planted on the Moon. Let's all celebrate with a boom. In hopes of spreading peace below."